Well, I don't know what it was like where you live, but for me, fall lasted approximately one week before Mother Nature dove head first into winter. As soon as we put the heater on (October for us), my skin started to dry up like a raisin. I went from having smooth, balanced skin to having patchy, flaky skin. No good, my friends, no good at all. Especially under makeup, gross. 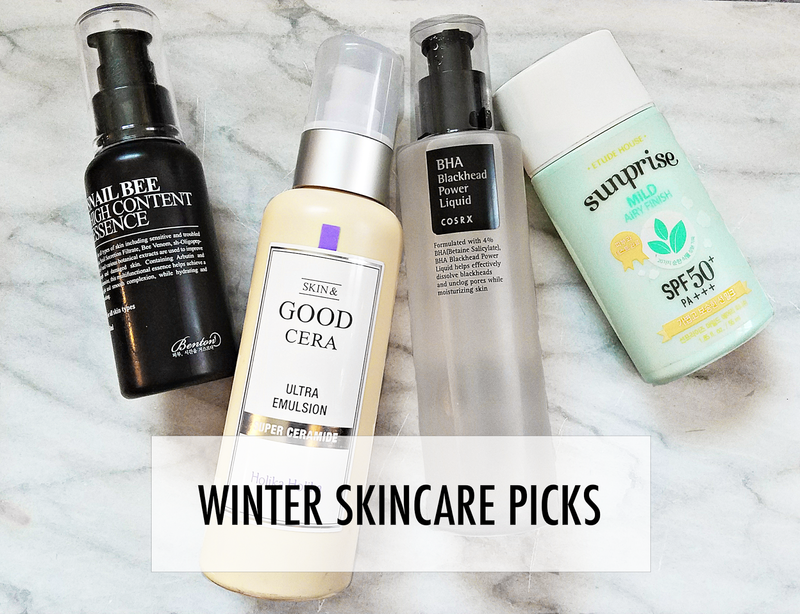 It's not unusual to need to revamp your skincare routine, either because of changing skin needs (hormones, medications, etc) or because of changing environment (dry, sunny, windy, etc). In my case, with my history of acne and my various medications, I have super dry skin, plus I have the addition of additives (like tretinoin and AHA) so I need a lot of hydration. 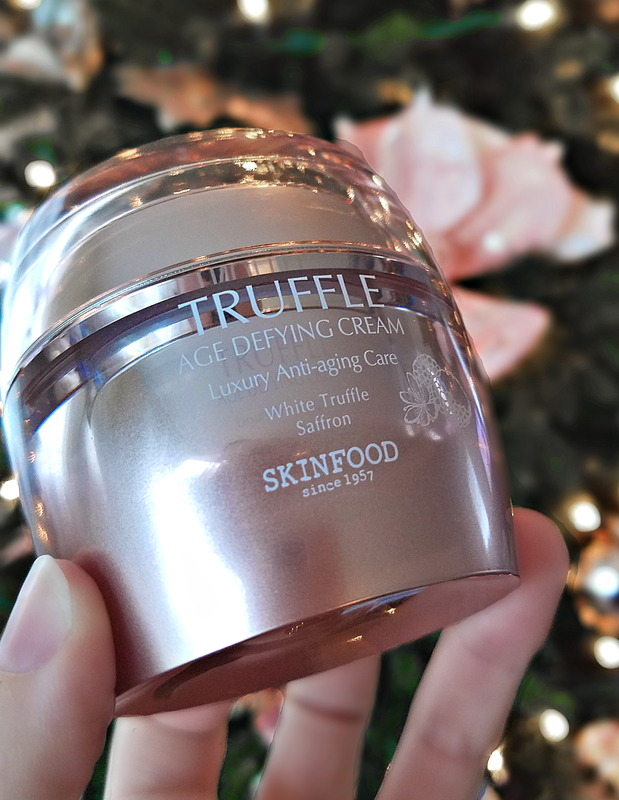 I just started used Skin Food Truffle Age Defying Cream and I have to say, so far I'm a fan. It provides a lot of hydration in one step, saving me quite a bit of time. So far I've been using it at night, and I'm thinking of getting one of the lighter formulations for day time. It also happens to have the cutest pink packaging, but that's neither here nor there. First and foremost, I use a cool mist humidifier in my bedroom. It's pretty sizable (and unsightly) and I mainly use it for my insane allergies, but it has the added benefit of also helping my skin and eyes stay moisturized. Definitely look into having one in your bedroom, there are many cute options for your nightstand. Second, although this looks like A LOT of steps, you'll notice I don't do every one every day. Also, I occasionally skip some steps if I'm in a rush. The thing that takes the longest is waiting 10-20 minutes after applying my acids (AHAs and BHAs) to apply other items. Honestly, most of the time I don't wait as long as perhaps I should. I'm looking for something to add here for a little more moisture. About once a week, usually on a weekend night, I use Neogen Dermalogy Bio-Peel Gauze Peeling Wine, which is pretty amazing, after cleaning and a Tony Moly mask before applying my final moisturizer. In all honesty, I don't really need to use the Neogen Gauze because I am using so many chemical exfoliants, but I just love physical exfoliation. I don't know what it is. It just makes me feel like I've gotten all the dirt and crap out of my skin! Because I'm taking so much out of my skin, I always follow up with a hydrating sheet mask and then my final step. So that's it right now! I know it looks like a lot, but honestly, it takes me less than 10 minutes in the morning. The additives and acids add a little time, but not that much. The thing that takes the longest amount of time is the mask, which I leave on for 20-30 minutes...and for that reason, it's usually just something I do on a weekend, although I'm trying to make time to do it midweek, too.